Maybe it is because many of the pinout diagrams for the Nano have SCL and SDA on the wrong pins. You probably think (as I did and as the guys laying out the pinout diagrams) that these would be on digital pins, but they are not. They are on analog pins. 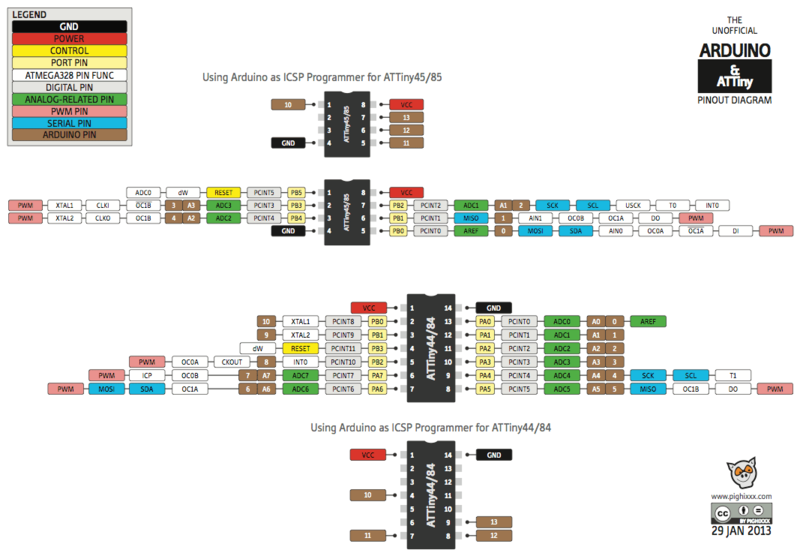 This entry was posted in c-arduino, c-tinys. Bookmark the permalink. Thanks for posting the pinouts! I was going to tediously go through the whole thing and map them out myself but no need now. This is amazing ! Beautifull & usefull pinout diagrams !!! what software it was used to do all of them, by example Arduino Mega’s? Great job. very useful. LIKE !! WOW, that is what I am looking for! Awesome overview! THANKS! I think you are misreading. 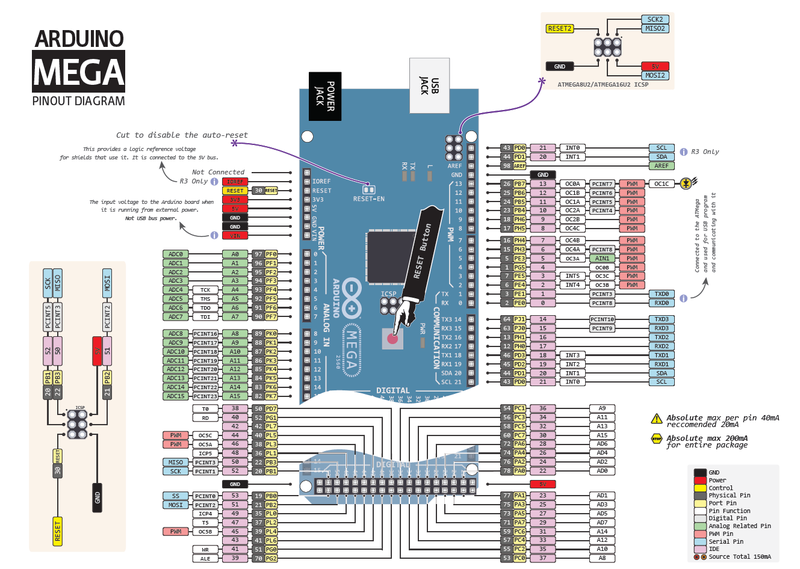 The arduino doc you mention indicates interrupts on pins 2, 3, 18, 19, 20, 21. 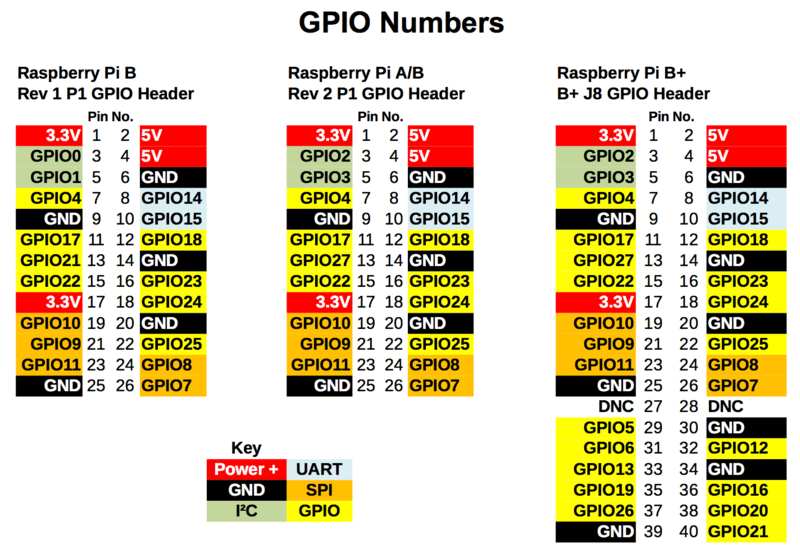 If you look at the IDE pins in the diagram (kind of a pink color), you’ll see interrupts 0-5 are assigned to pins 2, 3, 18, 19, 20, 21. If that is wrong, please explain. Thanks. OK, I at least see the original complaint now – the reference you are looking at says Pin 2 should be interrupt 0. I don’t have time to try this myself, so I tried to find additional sources that agree. 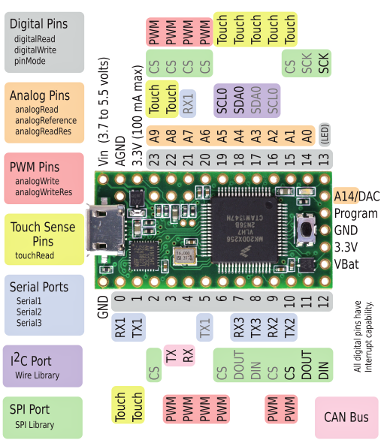 Unfortunately I can only find the original diagram I posted, the arduino.cc reference you mention, and this pin mapping diagram (https://www.arduino.cc/en/Hacking/PinMapping2560) which agrees with the picture not the reference. 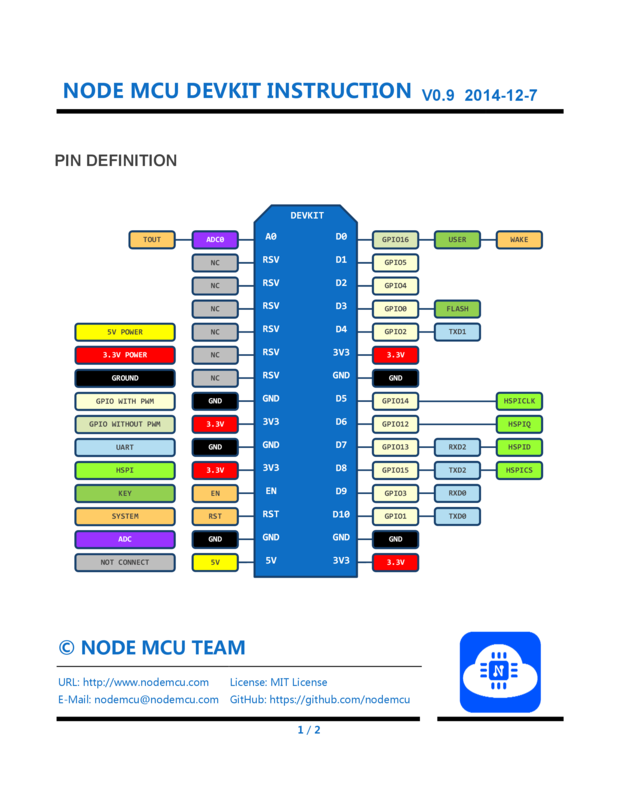 Have you tried using interrupt 0 on Pin2 on a mega and can verify the reference is correct and not the diagram or pin mapping diagram? It’s not my diagram so I can’t (well won’t) change it, but if it is correct I will stick some commentary before it. 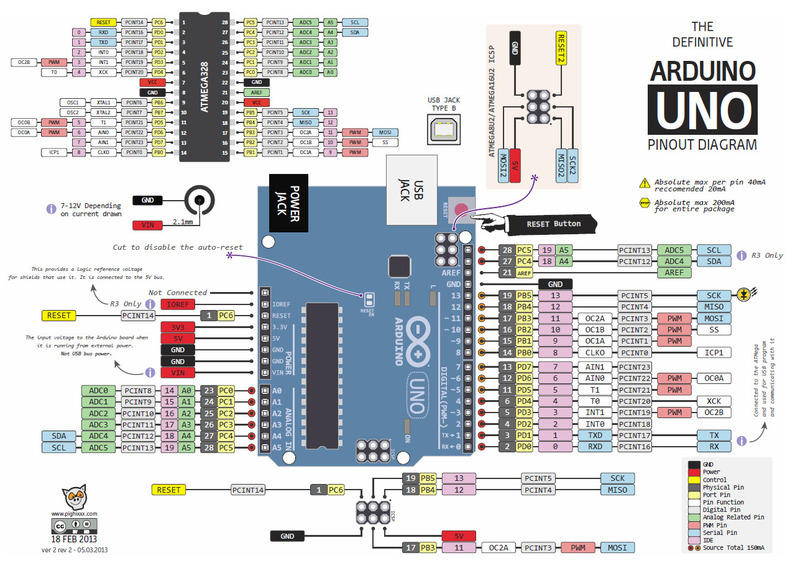 You forgot OC0B on pin 5 (PD5) of the Arduino Uno. Sometimes it’s not a pin out problem. I have an barometer sensor can run either 3.3V or 5V. When connected to 3.3V on Nano it does’nt work but on 5V. I’ve checked 3.3 voltage is OK.
On Uno board however it works from 3.3V Pin. Thank you. Thank you. Leave it to me to have this by my first board I’ve worked with. I of course resoldered all my connections thinking that must be the problem. Who’d have thought the board would be incorrectly labeled. One more notch in the challenge belt. Thanks again!